The most skilled woman golfer ever to come out of Peoria has to be Jill Briles-Hinton, a 12-year veteran of the Ladies Professional Golfers Association tour. She was a very good golfer at a very early age. The year she graduated from Peoria Central High School she won the 1981 Peoria Women's City tournament. Then it was on to the University of Miami for more golf where, in 1986, Miami was runner-up in the NCAA tournament with Jill finishing in a tie for seventh in the nation. She qualified for the LPGA tour on her first try and was a regular on the tour for a dozen seasons. Among her career pro highlights were three ties for second place finishes - in the 1987 Jamie Farr Classic, the 1988 Ocean State Open and the 1994 Children's Medical Center Classic. Her career earnings were more than $500,000. Some years ago she helped establish the LPGA Charity Pro-Ams in Peoria to benefit breast cancer research, an event that has become a major fund raiser with dozens of pros from the LPGA tour taking part. 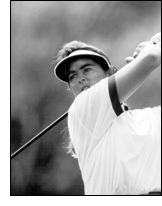 In 1998 she left the tour to become golf coach at the University of Florida. Paul Reatherford was the main ramrod in establishing Peoria's first Biddy Basketball program in 1951 at the old Salvation Army gym with 275 boys. He started as Coach and Director in that league in 1947 where he stayed for 23 years. That first year in the official Biddy program his team won the state title but lost its first game in the national tournament in Scranton, Pa., home of the Biddy program. In subsequent years, his teams would have first and third place finishes, plus one season where our town hosted the national tournament. 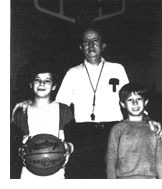 Reatherford directed the Salvation Army program until 1970 when he achieved a lifelong ambition to begin his own program - the Peoria Boys Youth Basketball League (PYBBL) where he is still the Director for 18 teams and over 200 boys. Paul has also coached Little League, Prep League and Pony League, helping upgrade the Pony League since his involvement there in 1969. A past recipient of the Neve Harms Meritorious Service to Sports Award, he is a member of the Illinois Basketball Coaches Hall of Fame. He has given a start to hundreds of youths who went on to high school and college sports - including Doug Altenberger, Eddie Matthews, Mike Dunne, Tom and Mark Gilles, and Roger Phegley. At a recent "Forty Years in Coaching" reception, Paul was officially recognized as the "Father of Biddy Basketball" in the Peoria area.